Bacon and especially BLT Sandwiches remind me of childhood summer visits to my grandparent’s house in Erie. We always had BLTs for lunch at least once while we were there and always ate them outside. They had a huge backyard with a large in-ground pool and we were usually dripping from the pool when we sat down to eat (and yes, we had to wait to get back in the pool after eating). If it was sunny we ate at the picnic table in the sun and if there was rain we ate on the covered patio watching the rain and wishing for it to go away. My Grandmother had a plastic dome that she used to cover plates of food in the microwave so they wouldn’t splatter. It was used do often for cooking bacon that almost everything that was cooked in the microwave had a slight bacon flavor from the plastic dome. My Grandmother has always been very opinionated. I remember when she came to visit one month before Juliana was born. I was so excited to show her the nursery for her first Great-Grandchild. She mumbled some pleasantries and went back to my parent’s house soon after. I found out later that my Dad got an earful on the ride home. Nothing short of what kind of mother was I putting my baby in a room all the way down the hall and that wasn’t the way things were done in her day. Another time that she was in town visiting we went to breakfast after church on a Sunday morning. It was my Dad, Brother, Grandmother and I. We ordered our food and as the waitress started to walk away, my Grandmother yelled, “If the bacon isn’t crisp I’m NOT going to eat it” and then went back to drinking her coffee as if this was perfectly normal behavior. The phrase has become part of our family vernacular and Christmas gifts have included many bacon items over the years, for example – a cast iron bacon crisper in the shape of a pig. Every time we have BLTs for dinner I wonder why we don’t eat them more often. 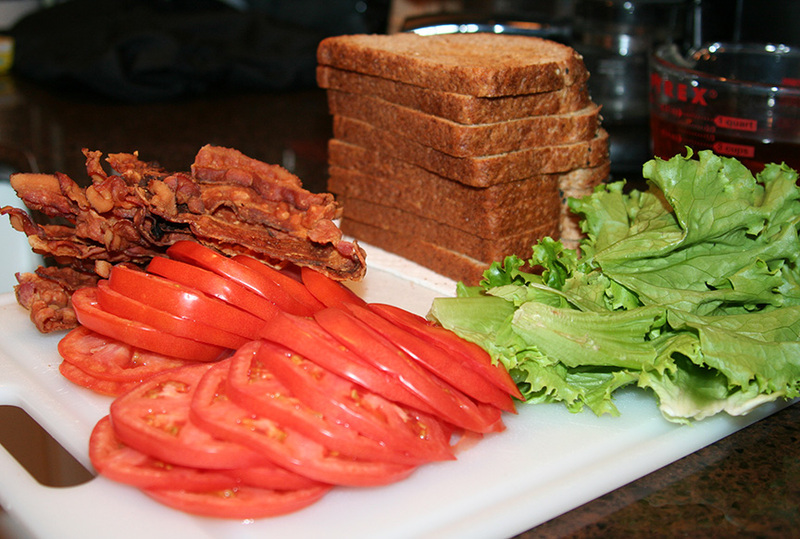 Crisp bacon plus ripe tomatoes are a perfect combination…add lightly toasted bread and leaf lettuce…yum. We had BLTs for dinner tonight and the first bite transported me to a sunny day swimming and eating lunch in my Grandmother’s backyard.